You’re not getting old; you’re getting ready. Improvements in healthcare. Deaths from cardiovascular disease and stroke are declining, and diseases including diabetes can now be handled more successfully than 20 or 30 years ago. Health-conscious habits. More senior citizens are prioritizing their health by taking nutritional supplements, eating and staying active. A holistic approach to health is becoming the norm. Continuing care retirement communities. Aging Americans have better accessibility to healthcare while maintaining active lives in a supportive community setting. THE LONGER YOU’VE LIVED, THE LONGER YOU CAN EXPECT TO LIVE! A man reaching age 65 today can expect to live, on average, until age 84.3. A non-smoking man who has reached 84 is likely to live long enough to celebrate his 92nd birthday. A woman turning age 65 today can expect to live, on average, until age 86.6*. A non-smoking woman who is 86 or 87 will live to an average of age 95! 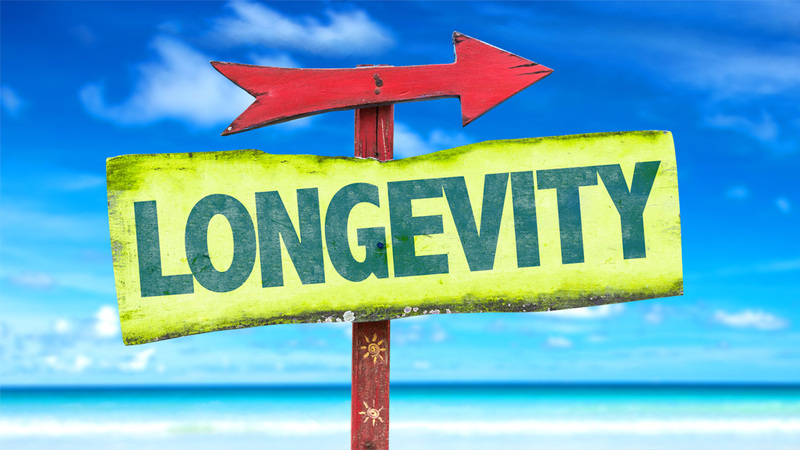 In spite of occasional political rhetoric to the contrary, we believe the tendency that is longevity is great news – particularly given the choice! However, it does represent a tremendous challenge if Americans insist on retiring at 65 with inadequate savings, as Social Security was never designed to be a retirement plan. Currently, there are 2.8 workers for every one man being supported by Social Security. As the population ages, that ratio is expected to reach two workers for each person supported by Social Security in the next 20 years. That is not a sustainable trend! As the longevity trend continues (and we hope it does), one thing remains clear: we have to rethink the entire notion of retirement and living a long and productive life. IS 80 THE NEW 65? The entire notion of retirement began less than a hundred years ago. The notion firmly took root as the consequence of the Social Security Act, that was passed in 1935. The word “retiree” did not enter the lexicon until the 1940s. In 1935, the average life expectancy proved to be just 61.7 years, and it probably appeared reasonable to establish the arbitrary retirement age at 65. However, with a realistic expectation of living beyond 80, it’s now beneficial to set aside a few of the outdated models of what retirement resembles, if retirement is even a worthy goal! In certain financial groups, increased life expectancy is viewed as being more of a “risk factor” than an advantage. The U.S. Census Bureau reports that half of U.S. workers have no private pensions and one-third of Americans have set aside no savings for retirement. And among those receiving Social Security benefits, a third rely on that monthly check for 90% or more of their incomes. By late 2014, the average Social Security benefit was below $1300, which will clearly be insufficient for many folks to live on! If a senior wants assisted living, they can expect to pay $4,000 or more per month in most areas. Then there’s the problem of “retirement plans.” You also planned on retiring at 65 and for those who are in possession of a normal pension, IRA or have a 401k plan set up, it may not be elastic enough to stretch for more than two decades. Even if your savings are calculated to account for inflation, it is often demonstrated the Consumer Price Index cost of living computations TEND NOT TO keep pace with real world inflation. Even if typical retirement plans have become less viable, we are able to begin by saving more – we urge 20% – and we also can reevaluate our expectations. Starting retirement at 75 or 80 gives us 10-15 more years of saving and making. For those that can readily afford to retire at age 65 or before, there may be better, more interesting choices than the usual life of leisure. Here are a few cases of those who have previously researched strategies to make their long lives even more comfortable and carry them through! Poppy Bridger retired at the age of 69. Three years after, she used her life savings to buy the laboratory she retired from. The business brought in about $350,000 a year and she ran it until she passed away in 2013 at the age of 89. She turned “retirement” into a prosperous second act. Nash went on to state that individuals desire a goal in life and claims that government-legislated retirement ages are arbitrary. Nash still delivers tons of seminars annually throughout the United States, speaking on the financial ideas outlined in his classic book, Becoming Your Own Banker. Young at Heart is an acclaimed documentary that emphasizes how one group of seniors is breaking the mold by performing pop, modern rock, and also punk music throughout the United States and beyond. The Young at Heart Chorus bills themselves as “seniors behaving badly,” but it’s all in fun. The minimal age for the choir is 73, plus they focus on performing tunes not usually sung by mature adults, including James Brown tunes The Ramones, The Clash and Coldplay. The film is touching in addition to amusing… prepare to laugh as well as cry! For those that love their work, working full or part time, may be a great option. For many, joining periods of work with intervals and sabbaticals of diversion or travel is likely to be an appealing model. For others, significant volunteer work (with or without part time paid work on the side) will provide meaning as well as a feeling of contribution. For still others, the perfect strategy might be to use “retirement” to take up a business, write novels, or do what they have always desired to do… and get paid for it! Along with crunching on some serious numbers to disclose the reality of retirement plans, it’s important to find a fulfilling and rich experience much beyond age 65. If you are interested in taking a closer look at your retirement planning strategy, contact the financial professional that sent you this article, or if you’re looking for an advisor, TRUVIUM FINANCIAL GROUP can provide you with an advisor who can help you determine your objective, fact-based, advise toward financial confidence in your retirement years. Material discussed is meant for general informational purposes only and is not to be construed as tax, legal, or investment advice. Although the information has been gathered from sources believed to be reliable, please note that individual situations can vary. Therefore, the information should be relied upon only when coordinated with individual professional advice. This material contains the current opinions of the author but not necessarily those of Guardian or its subsidiaries and such opinions are subject to change without notice.